"Cutting Words" explores the many layers and power of language through the delicate cuts of paper. Choices of daily words and assembling of sentences have the ability to cut, hold weight and can effect communication and interpretation. Language should be specific, otherwise slicing and tarnishing our original intent. This piece focuses on words that can shift the weight of a conversation towards thefragmented or defensive. 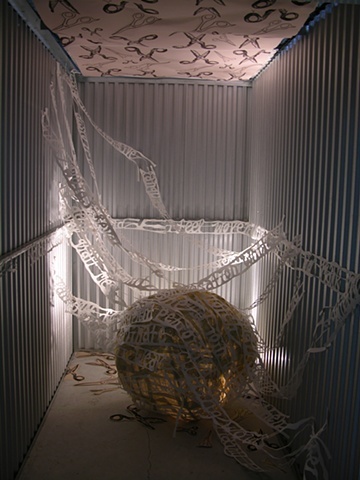 "Cutting Words" was selected to be part of the 2010 4th Annual 10x10 installation show in Lake Worth, Fl, curated by Kara Walker Tome. Visit this article in examiner.com on my piece for more information.